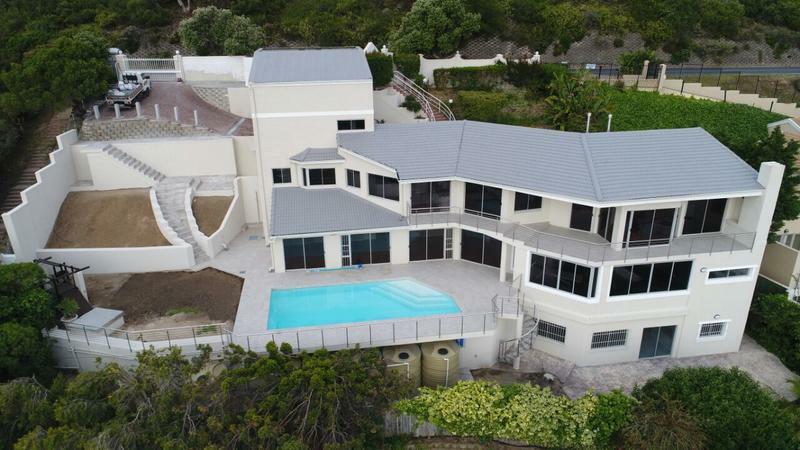 One of the most panoramic views of Llandudno from this magnificent property located high up against the slopes of this exclusive suburb. This multi-level unfurnished spacious family home offers 5 bedrooms, a staff room, separate self-contained downstairs flatlet, 2 living areas, and pool. Garages for 4 cars and plenty of guest parking. Separate staff room with kitchenette and bathroom – access from garage. Walk into a spacious open plan living and dining area with sweeping views from every angle – all open to a long balcony. The lounge has connections points for TV etc; a big wood burner; and a study, which leads off from the lounge and a spiral staircase leading to a spacious storage room below. Guest toilet. Spacious kitchen with lots of counter space, breakfast nook, and an enormous scullery area. Leads off from the living area and has an en suite bathroom. Cosy family room with wood burner. Sliding doors Open onto to pool and patio area. Bedroom 2, master bedroom:- spacious with open plan luxurious bathroom. Opens through sliding doors to the pool area. Bedroom 3,4 and 5 all with b.i.c. 's and all open onto patio and pool area. All 3 bedrooms share a big bathroom with shower and bath. Plenty of water storage with 7x 5000-liter tanks which service the pool, garden and is plumbed into the house. The house has an alarm system.